CELEBRATING AND DEFENDING THE NHS! 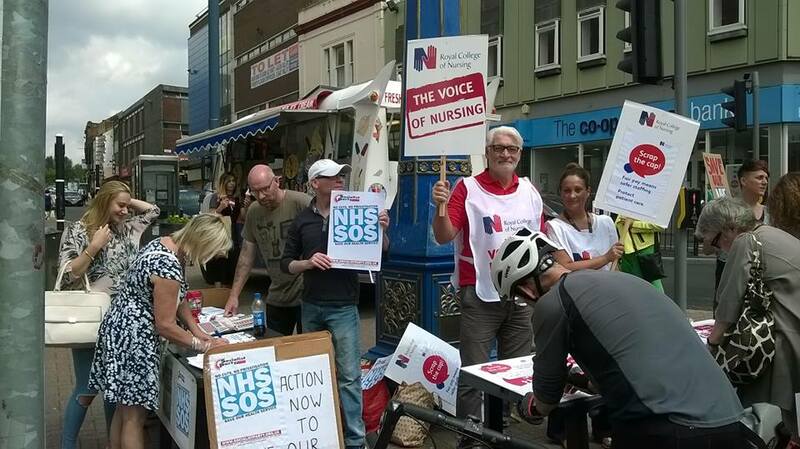 Excellent response today in Hanley in support of the NHS. It was part of many such protests, demonstrations outside hospitals and in city centres across the country. Save Longton Cottage Hospital (SLCH) campaigners were joined by the nurses union RCN members, Stoke Socialist Party members and other local activists to give out leaflets to hundreds of people. Many people queued up to sign petitions, take away badges, leaflets etc. RCN members are carrying out a summer of nationwide protests over their pay which has fallen by a staggering 14% in real terms since 2010. The SLCH campaign is fighting to get the hospital’s beds re-opened and to stop it’s closure. These campaigns like many others across the country are all part of the battle to stop the Tories from dismantling and privatising our NHS. And they will continue until we force the Tory government to scrap their plans. SLCH is affiliated to Health Campaigns Together. The national campaign group which organised the marvellous demo to save our NHS in London on 4 March 2017. JOIN THE PROTEST ON WED 5 JULY TO CELEBRATE AND DEFEND OUR NHS! Join us to celebrate 69 years of the NHS and to continue the fight against the government’s under-investment in the NHS and its hard-working staff. The protest is being hosted by Save Longton Cottage Hospital (SLCH) campaign group and the nurses union, the RCN. It will be just one of the many protests that will take place around the country on 5 July to celebrate our NHS. We are calling on all local groups, trade unions and individuals who want to defend our NHS and its staff to come along to our protest. Bring your banners or posters if you have them or maybe make some if you haven’t! SLCH is affiliated to Health Campaigns Together which helped organise the marvellous demo of over 200,000 in London on 4 March. RCN members are taking part in a summer of protest over pay, which has fallen by a staggering 14% in real terms since 2010. IT’S OUR NHS! IT’S NOT FOR SALE! FIGHT TO DEFEND IT OR LOSE IT FOREVER! In the two years we’ve been running the #SaveLongtonCottage campaign we’ve seen the beds at Longton, Bradwell and Cheadle taken away, Leek Hospital loses its beds in October and now Haywood has been placed on the list ‘considered for closure’. The CCG, doing the dirty work for the Tories, argue that Royal Stoke can cope with a huge increase in patient numbers, therefore we have no need for local beds in local hospitals. This is a ridiculous position to take, as the many staff and patients we’ve spoken to are in no doubt that Royal Stoke cannot cope with the workload it currently has. Loading more work onto a hospital that is already stretched beyond reasonable and safe limits is a recipe for disaster. This situation is not unique to North Staffordshire, the NHS as a whole is facing ever increasing pressure as a direct result of government policy. Their response to the concerns of NHS staff is to dismiss them as ‘complainers and malcontents who are resistant to change’. No. They are dedicated, hard working, conscientious people who see the public service that they love, that they know the true value of, being downgraded, purposely overloaded and all for one reason. To enable the government to claim that the NHS, OUR NHS, isn’t up to the job so let’s bring the private sector in to make it all better. You only need look to the railways and the utility companies to see that privatisation does not make things better, it simply makes money for the private sector, taking profits away to the tax havens of the rich and resulting in a bad deal for the public who provide the funding in the first place. Not enough beds – operations cancelled again! Problem? “Planned operations have been cancelled because critical care beds are swamped with victims of a flu outbreak. The routine cases were called off as no beds were left for them to be moved to for recovery after leaving theatre.” See the Sentinel 22 March here ….. Conclusion? We do not have enough beds to deal with an outbreak of flu. But there is an ‘outbreak of flu’ every year at some point. Answer? Re-open beds at Longton Cottage Hospital, scrap ongoing plans to close more beds and provide sufficient beds to ensure that there is never a shortage of beds again. Local Health bosses have spent many hundreds of thousands of pounds over a year trying to convince themselves that closing 37 beds at Longton Cottage Hospital was a great idea. In the process they ignored the more than 10,000 local people who stated in writing their opposition to their plans. Yesterday in the Sentinel (see link above) we had the latest ‘shortage of beds’ story in a long line of similar revelations in recent years. When are these local Health bosses on their bloated salaries going to accept that their so-called ‘New Model of Care’ is a failure? And it will continue to be a failure because of on-going cuts in government spending in the NHS and plans to privatise services as much as possible. The time has surely come for the local Health bosses to admit that their closure of beds at Longton Cottage Hospital are making the situation worse and that they should be re-opened now to provide at least some of the beds that are so desperately needed. “Delays at A&E can’t go on” – Time to re-open beds at Longton Cottage! In the Sentinel 22nd December 2015 under the headline, “36 hospital beds open to prevent winter crisis”, an unnamed ‘NHS official’ told us, “Last year the health care economy experienced severe winter pressures which resulted in unacceptable waiting times for patients accessing A&E. “This is why we have spent much of the last year planning a number of measures to help the system work better for patients and staff”. Since then we have seen the winter’s first patient to wait on a trolley in A&E for more than 12 hours. In the Sentinel 9th January under the heading “Delays at A&E can’t go on” we are now told by CCG chief officer Marcus Warnes that, “Significant measures have been taken by partners to address the challenge but the sustained improvements expected have not happened as planned. But Marcus Warnes along with others running our local CCG’s are the ones responsible for closing 37 beds at Longton Cottage Hospital and refusing to reopen them despite the obvious need for extra beds. They have spent over a year and hundreds of thousands of pounds carrying out a so called consultation. This ‘consultation’ is basically designed to convince people that we don’t need those beds and that we don’t really need Longton Cottage or all our other local hospitals. Now they talk about bringing in ‘experts’ to sort out this mess. But ‘experts’ are not needed. There are empty wards at Longton Cottage and beds in ‘storage’. Surely it’s quite simple! Re-open those wards, bring the beds out of storage to be used whenever they are needed to take pressure of the A&E. In this way potential fatalities could be prevented BEFORE they actually take place. Royal College of Emergency Medicine president Dr Cliff Mann predicts the “worst is yet to come”. So why have our local Health Bosses spent TWO YEARS carrying out an expensive and sham consultation to force the closure of 37 valuable beds at Longton Cottage Hospital? SAVE LONGTON COTTAGE HOSPITAL has said from day one that the NHS Health Bosses so called consultation is merely a marketing exercise for what they have already decided to do. That is, to do what they are paid to do – dismantle and privatise our NHS. Their six public ‘consultation’ events are now over. They have taken place, in the Moat House, Etruria, Fenton Manor, Longton, Leek, Bentilee and Cheadle. We estimate that less than 50 ordinary local people have attended these meetings in total. Why have local people shunned their events? Because, we don’t like being conned! Health Bosses have failed to answer crucial questions surrounding their ‘consultation’. How can a serious consultation be carried out about closing the beds at Longton Cottage when they have already been closed! And how can they claim that their ‘New model’ of care in the community is viable when, “patients ready to leave hospital but cannot be discharged because of a lack of community services available to care for them” is the real situation which exists right now – before further cuts to NHS funding? SAVE LONGTON COTTAGE HOSPITAL demonstrated how a real, meaningful consultation should have been carried out at our first consultation public event in Longton on 17 August. That is, with representatives of Local Health Bosses AND of those opposed to their plans given an equal opportunity to put forward their cases for and against. This is one reason why there was almost three times more local people at this one event than at all of their 6 public ‘consultation’ events added together. And the unanimous rejection of their proposals at our Longton public meeting was one reason why all of their 6 events were stage-managed to limit the attendance and make sure that they were strictly controlled. Read a detailed report of their Moat House event here. After the consultation sham …. Monday 30 November at 7.30pm in OUR BAR, London Rd, Stoke.